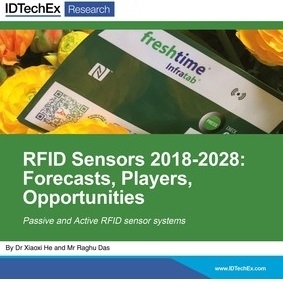 According to a report from IDTechEx Research, the entire RFID market will be worth $11.76 Billion in 2018, up a steady 5% from 2017. A small sub sector of that entire market, but one which will grow at a faster rate of 12% from 2017 to 2018, is the market for RFID sensors. These are sensors with wireless communication based on one of the RFID protocols. The benefit of using a RFID transceiver over other wireless protocols such as Bluetooth or Wifi is that RFID transceivers are inexpensive - RFID ICs are the cheapest integrated circuits in the world; they are low power, with only a small battery needed and no battery is also an option; and they can leverage the increasing RFID infrastructure being deployed, from near field communication (NFC) phones to RAIN RFID reader infrastructure in businesses around the world. As explained in the new report RFID Sensors 2018-2028, there are several RFID sensor options which can each work at different RFID frequencies. The most established technology has been battery assisted RFID sensors, which use a power source to take sensor measurements. More recently there have been battery-less (passive) RFID sensors which only take sensor readings while close to the RFID reader which energizes it, limiting their application as a result. Passive RFID sensors are, however, simpler and cheaper since no power source needs to be integrated. IDTechEx has found that the average sales price of battery assisted RFID sensors in 2017 is $16 versus $1 for passive RFID sensors. While businesses in battery assisted RFID sensors tend to peak at about 25,000 units sold annually, with the total 2017 sales of 330,000 units for that type of technology, passive RFID sensors have found many high volume niches resulting in an estimated 5.2 million passive RFID sensors sold in 2017. In total, the market value for all four types of RFID sensors identified in the report is $10.5 million in 2017, rising to almost $400 million in 2027. The RFID Sensors 2018-2028 report provides thorough research on RFID sensors, with over 100 organizations covered, case studies, detailed market projections by technology and frequency, as well as current and future challenges and opportunities.